On 23rd April we set out from Brisbane on what was to turn into a 2,477nm (2,851 statute miles ; 4,587km) voyage up the east coast of Australia to Cape York (the pointy bit on the top RHS of the map) and across the Gulf of Carpentaria to Darwin, capital of the Northern Territory. This trip was described by Aussie sailing friends as "jumping the fence and crossing the paddock". It took us exactly nine weeks and was probably the fastest and most rumbustious sailing we have ever experienced. Once into northern Queensland the winds were typically SE 20-25kts, picking up to over 30kts when the Highs crossed the Australian Bight 1,500nm south of us. The plan was to get north quickly, by-passing where we had already been, so here we are at Great Keppel Island. The sailing was pretty intensive with many 85nm daysails and numerous overnight passages. 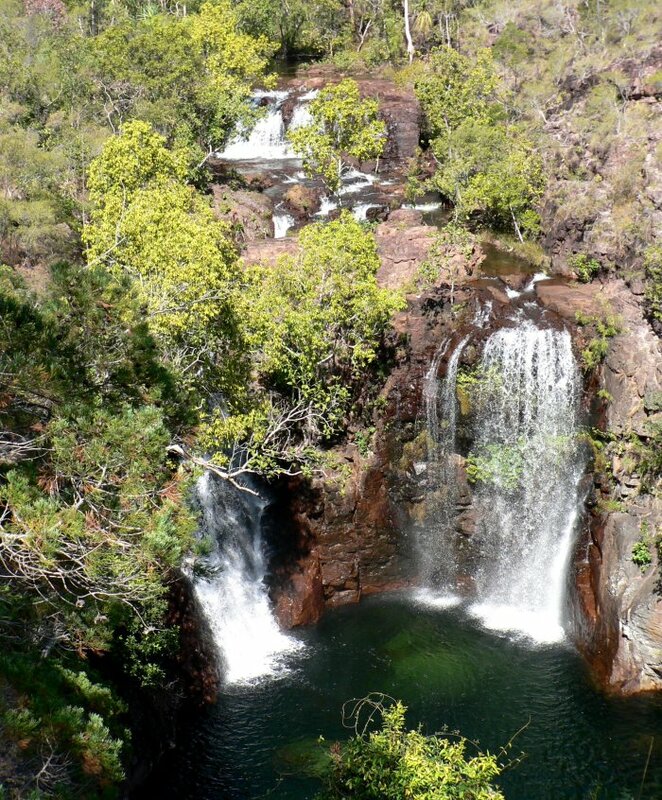 However, we did allow ourselves two days each in Mackay and Townsville. The latter was a charming place with a superb maritime museum hosting a remarkable exhibit of artifacts from HMS Pandora which had been sent out from England to recover the Bounty and her mutinous crew. They did find some matelots in Tahiti but missed the main group hiding on the unknown Pitcairn Island by 150km, before been driven onto the Great Barrier Reef just north of Townsville on 29th August 1791. We arrived in Cairns on 20th May, just ahead of more strong winds and a week of wet weather, so it was an easy decision to have a week off to indulge in the tourist attractions of "Backpacker Central". 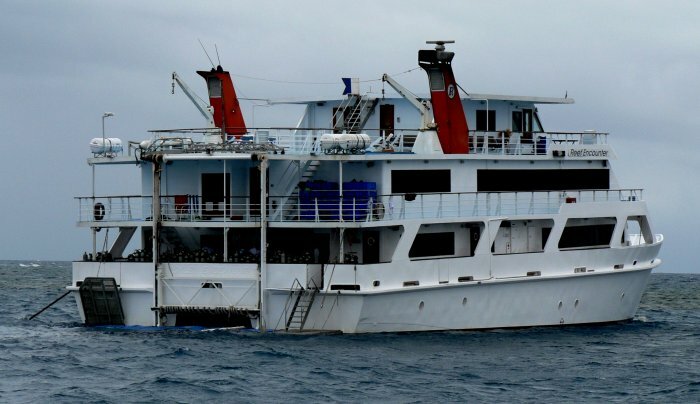 Our first exploit was a two day trip to the outer Great Barrier Reef, spending a night on a sumptuous diving mother ship. Life aboard was anything but relaxed though, with a demanding programme of marine exploration, eating and sleeping. Di managed to get in seven snorkeling trips whilst Dave had four daytime and one night dive. There was a resident photographer aboard so Dave managed to get on the other side of the camera lens for once, even though he did have a camera in his hand! 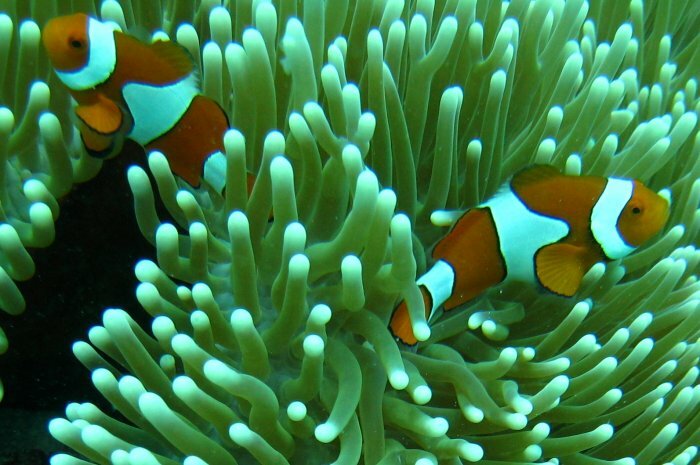 These Clown Anemone Fish (Nemo's cousins) were in Dave's viewfinder as the picture above was taken. 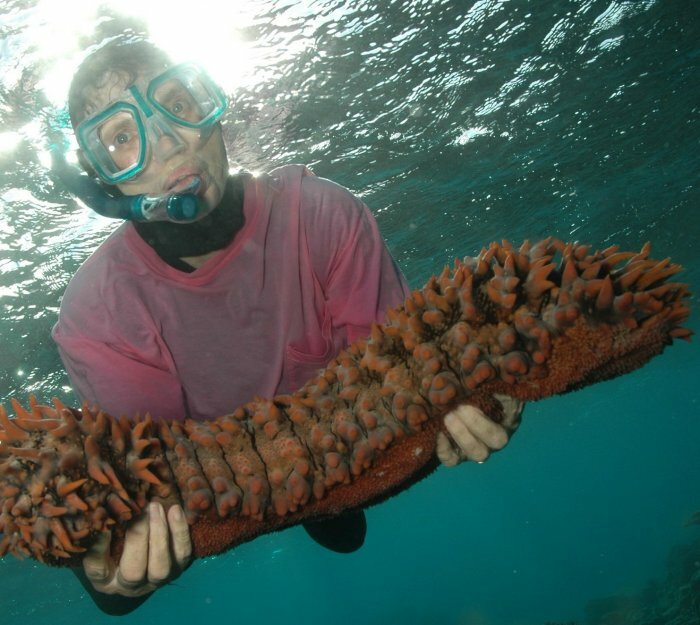 The variety of marine life on the Great Barrier Reef was impressive but having dived and snorkeled so many remote sites in the Caribbean and South Pacific, it was not the same experience on reefs explored so intensively by daily punters. Once north of Cairns the coast changes as the Barrier Reef comes in close to the mainland with a navigable passage often only a nautical mile wide which is shared with numerous large commercial vessels. After only 150nm we came upon Lizard Island, a wonderful place to tarry a day or two. 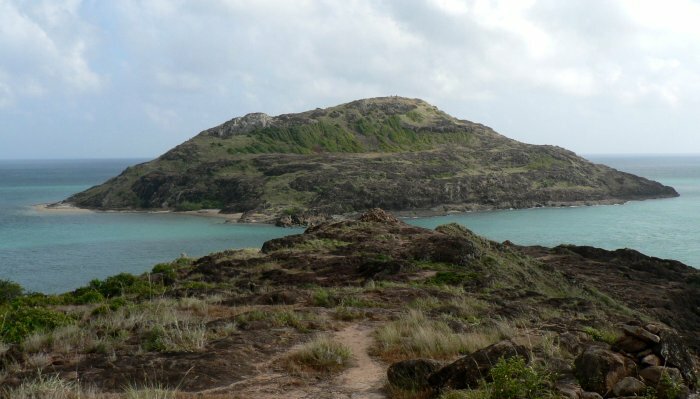 This was the place where in 1770, Capt James Cook climbed the hill to spy a way through the myriad of offshore reefs. Endeavour did escape but they were so troubled by the seas outside, they found a way back in within a few days. 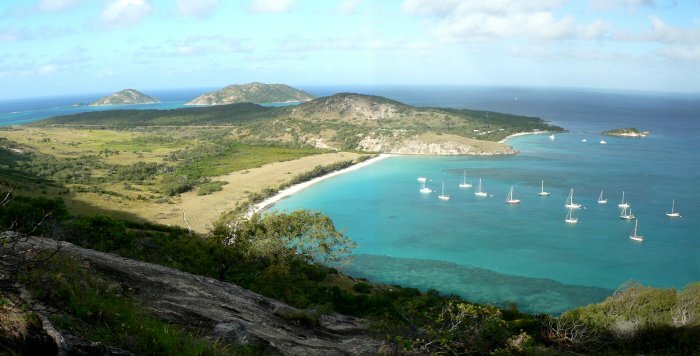 The walk up to Cooks Look is rewarded by magnificent views over the island and the many large coral reefs. 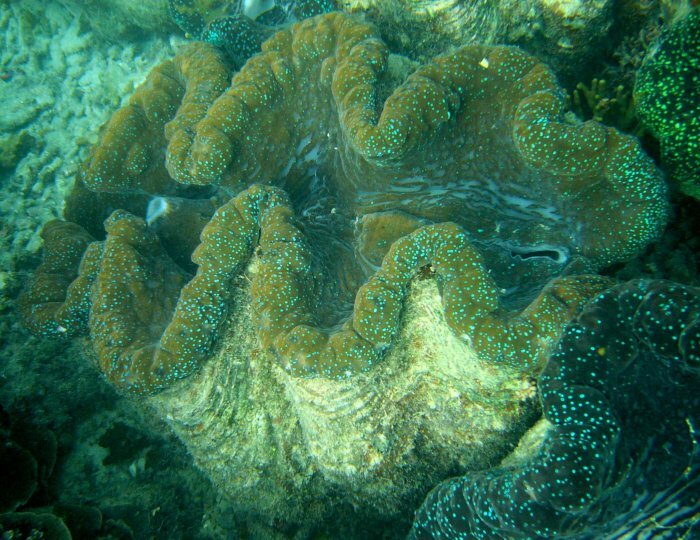 The bay on Lizard we were anchored in had numerous reefs with a very special collection of giant clams up to 2m long of varying colours. 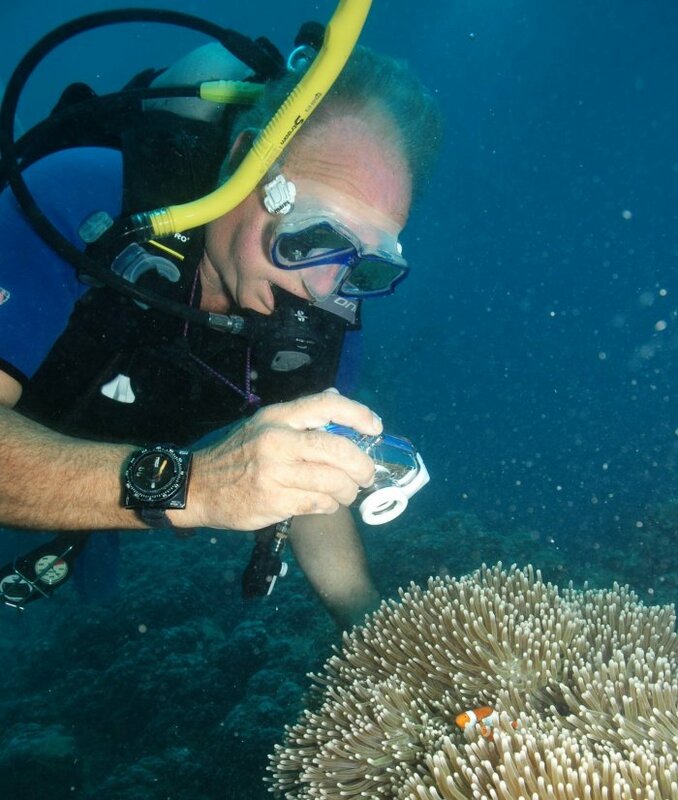 The northern reef in particular was home to a remarkable number and range of fish species so the task of identifying and cataloguing several hundred underwater pictures kept us busy for some time. Once north of Lizard, within the confines of the navigable channel we became aware of how remote the area is. You can sail for days without any sign of human activity, other than the odd navigation mark. 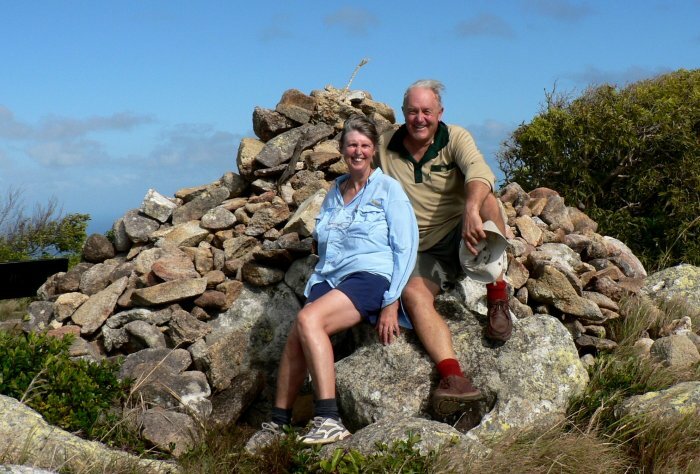 Cape Melville was particularly memorable for a terrain strewn with huge boulders. 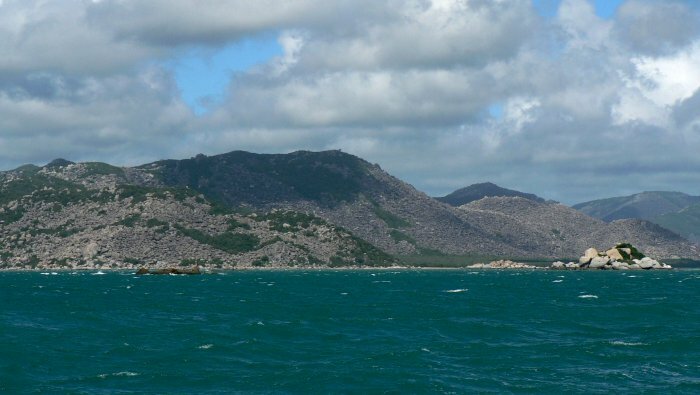 The Flinders Group of Islands was another spot worthy of an additional nights stop. Stanley Island with its castle-like rock buttresses made a great backdrop to an anchorage. There was also a chance to get ashore there to see the extensive rock paintings, some of which depicted the visits of the early sailing vessels that explored these shores. At last on the 6th June we reached Adolphus Island, 1571nm north of Brisbane and just 7nm east of Cape York. Next day we rounded the Cape, anchoring close by in a shallow bay so we could explore this Aussie icon, the continents most northerly point. After so little contact with the outside world for so long it was a great shock to find groups of tourists that had made their way there by 4WD vehicles. Almost as big a surprise was being confronted by a sign which read "Achtung Crocodiles", placed there after two Germans had been killed some time ago. 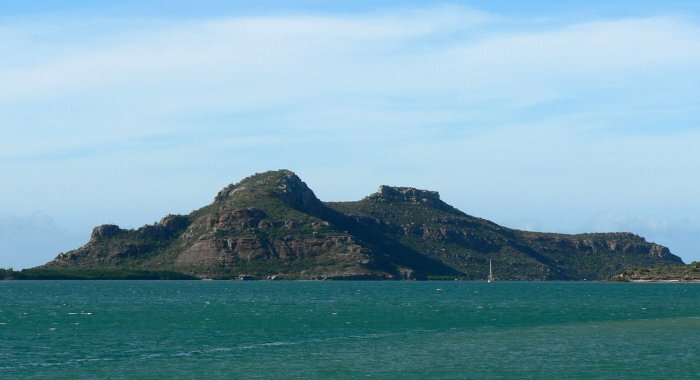 Below is the view of the cairn at Cape York and the island of the same name just beyond. In Australia, illegal immigration is a major political issue with the current government taking a tough stand and introducing a number of internationally controversial measures. We came up against this as we approached the north of the country, being overflown and interrogated virtually every day by Coastwatch aircraft. This in spite of them having descriptions and photographs of every sailing vessel in the area. 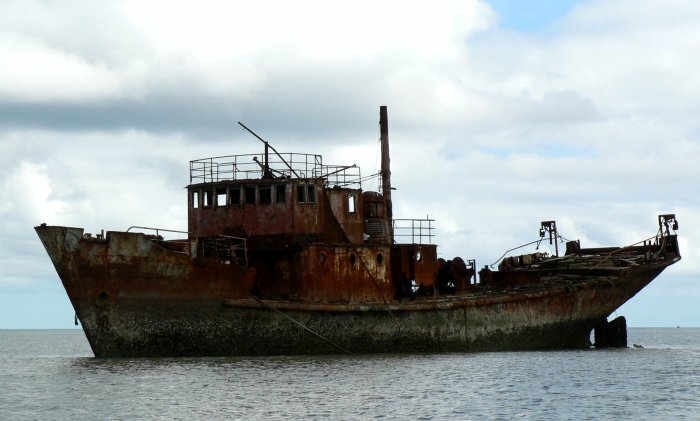 The real problem is not so much sailing vessels crewed by geriatric Europeans but fishing boats like the one below, beached just off the port of Seisa in the NE of the Gulf of Carpentaria. About three years ago it had landed around 350 people on Thursday Island in the Torres Straight. It is difficult to imagine how so many could be cramped onto something about twice the length of Amoenitas. Having rounded the Cape, the next hurdle is the Gulf of Carpentaria, a shallow 350nm wide bay in an area so remote that the southern shores of the Gulf are only partially charted. With strong winds and water depths averaging around 30-40m, it has a reputation for rough, confused seas and uncomfortable passages. A number of boats we know sustained serious damage on this leg but we were lucky having a fast but not too bumpy ride. Our wind steering did have a piece fall off with a clatter into the cockpit, in the middle of the night when Di was on watch, causing shrieks which rapidly raised Dave from his slumbers! 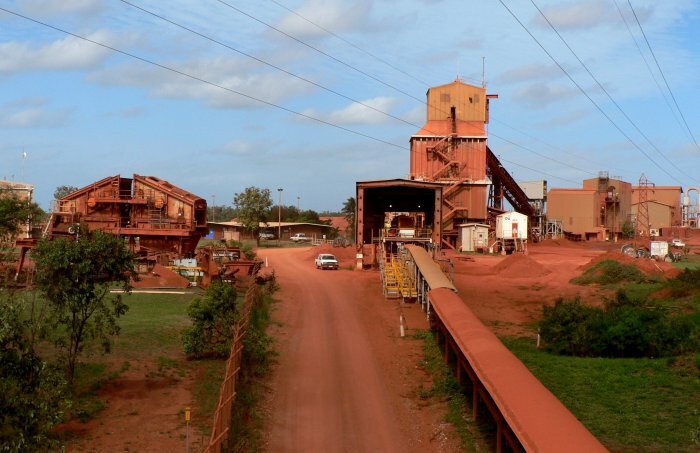 Strong winds were again forecast as we approached the western edge of the Gulf so we pulled into the sheltered harbour at Gove, a town totally dedicated to one company and one objective, the strip mining of bauxite. The company was ALCAN and the product aluminium. Though a very strange community of company homes with outlying 'villages' of container accommodation, the inhabitants were exceedingly friendly and helpful. Being a total company place, the only public transport was run by them and outsiders like ourselves could not use it. However, this was not a problem as we had copious offers of lifts from people like Graeme and Leonie who had been there over thirty years and devoted many hours to transporting, informing and entertaining us and two other sailing friends. Strip mining involves removal by truck of a layer of ground between about 1m and 6m below the surface over vast tracts of the landscape. This is then crushed in the plant shown below before being transported by a conveyer belt around 10km long to a huge processing plant. This disgorged smoke, steam and fumes on a vast scale, not to mention the night time light pollution. We wondered what proportion of all this effort ended in discarded drink cans! Our new found Gove friends not only arranged the welding of the wind steering but showed us around, including a visit to an Aboriginal museum and cultural centre. 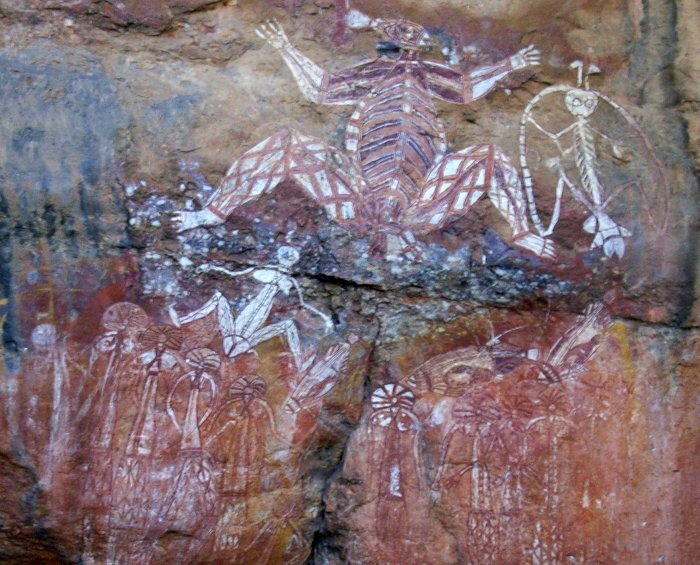 This had a range of indigenous work way beyond anything we had previously been exposed to. So, it was not at all surprising that we came away with a significant painting on bark and Dave's second didgerido. He is still struggling to master the first one acquired near Cairns but is intent on attaining public bar, if not concert hall standard. Crossing of the Gulf had taken us from the State of Queensland to the Northern Territory, a fledgling in transition that broke away from South Australia some 35 years ago. There was still 500nm of remote, almost empty country to skirt before reaching the capital city of Darwin. We sought shelter in a succession of isolated bays in low, scrub country on the mainland and offshore islands. Though often beautiful with fringing white sand beaches, trips ashore were few due to the danger from estuarine salt water crocodiles. This is a real and serious threat as they grow to 7m in length and using their powerful tails, can propel themselves up to two thirds of their length out of the water. So, even on a boat you need to be aware as they have grabbed animals and people from decks! Armed with all the local knowledge we could acquire about evasion strategies if attacked, we did go ashore on the odd occasion but saw only scrape marks and footprints from creeks across the beach and into the sea. Exactly nine weeks after leaving Scarborough Marina, just north of Brisbane we anchored in Fannie Bay with its welcoming sailing club, almost walking distance from the centre of Darwin. We had a lot of preparation to complete for the trip ahead both administrative and nautical, so it was with relief that we found a berth at the nearby Cullen Bay Marina. The big advantage over anchoring was access, as with 6m tidal range and a shallow bay we had been subjected to 500m tender rides ashore, coupled with major portage up and down the beach. Darwin is a charming place, big enough to have everything you might need but at the same time small enough to get your head around instantly, as well as being accessible easily on foot. We are lucky also, in that having two mountain bikes aboard, the whole city is our oyster within 30mins of pedaling. We were there for the State Foundation Celebrations which seemed only to comprise an excuse for all and sundry to make as much pyrotechnic din as possible. 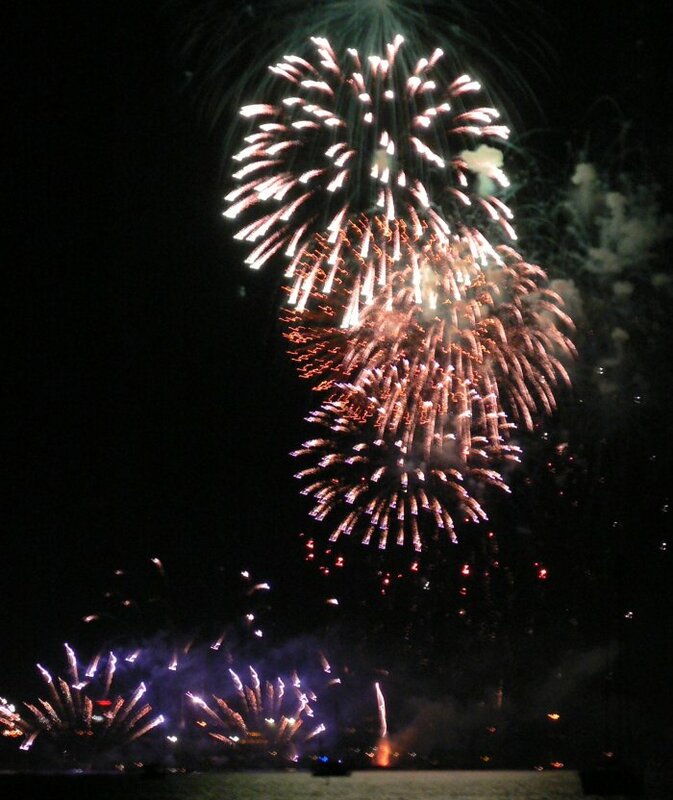 Below is an example of the splendid official display which we viewed from a friends boat in the bay. The plan had been to arrive in Darwin with enough time to prepare for the onward passage to SE Asia and to do some serious 'Top End' touring. So with friends Chris & Fiona from Carelbi we hired a 4WD vehicle and set out to explore some of the many attractions within about a 500km radius. First stop was the Litchfield National Park, an expanse of rivers, falls and bush littered with millions of red termite mounds, some of which towered to over 3m. Lots of good walking and swimming was had, mainly early in the day as the heat sapped all enthusiasm by mid-afternoon. Our journey took us as far down the Stuart Highway as Katherine , one of the few outback towns of any size for thousands of kilometers. 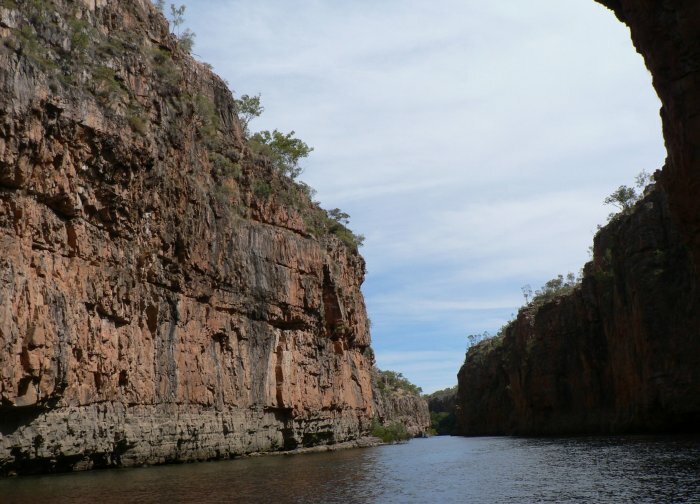 Nearby is the gorge of the same name, an astounding natural phenomena stretching for miles through sandstone country. In two hours afloat we covered just two of the thirteen navigable sections, each one separated by rock strewn falls that we had to walk around. 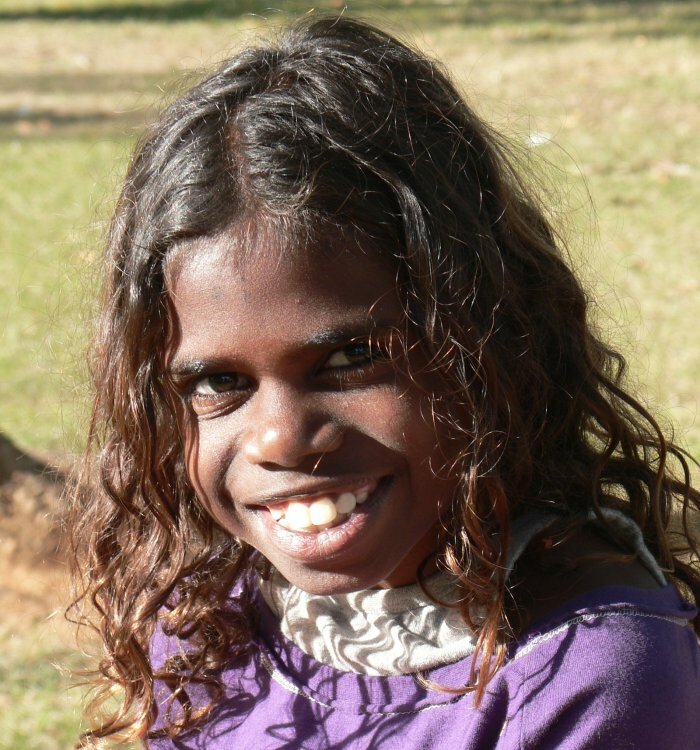 This northern part of the continent is home to around 65% of Australia's aboriginal population. Whereas in cities like Sydney, Melbourne or Brisbane they are seen very rarely, here in the north they are an ever present reminder of the social and economic divide, not to mention some extremely sad historical events. This smiling face beamed out to us across a park in the centre of Katherine. 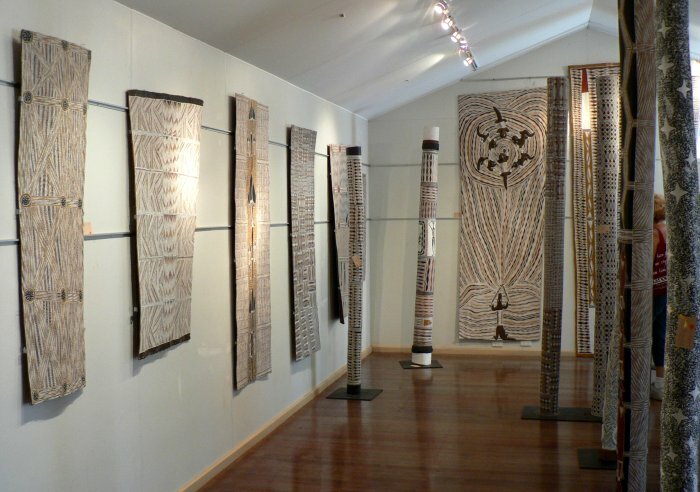 Though the indigenous peoples seem to live principally outside the general economy surviving mainly on handouts, their art has a significant impact on the overall community. We had seen many paintings, totems, decorated didges, etc before but never as many rock paintings as we were to see in the northern regions. This is one of the more sexually explicit examples which we hope won't cause too much embarrassment. 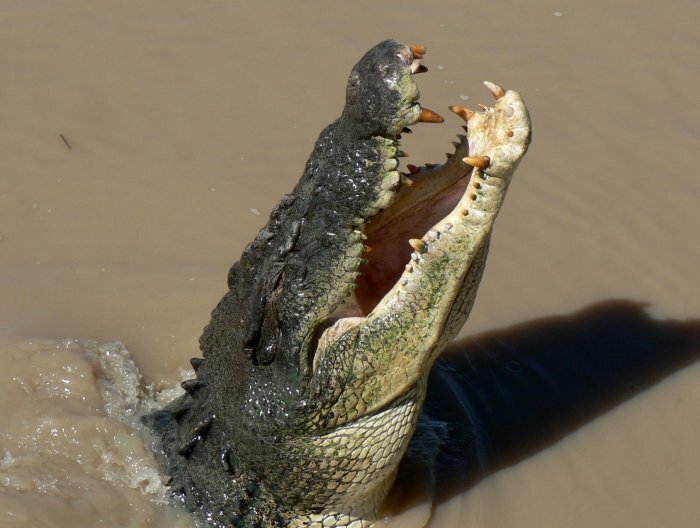 Crocs have been mentioned already and had played a not insignificant role in determining our daily routine for 1500nm since leaving Cairns (they can swim to islands 50nm offshore). So, it was with great excitement that we approached our first encounters with these fabled and formidable creatures. The youngster below was only about a couple of metres long but easily capable of terminating your longevity in the space of a few seconds. 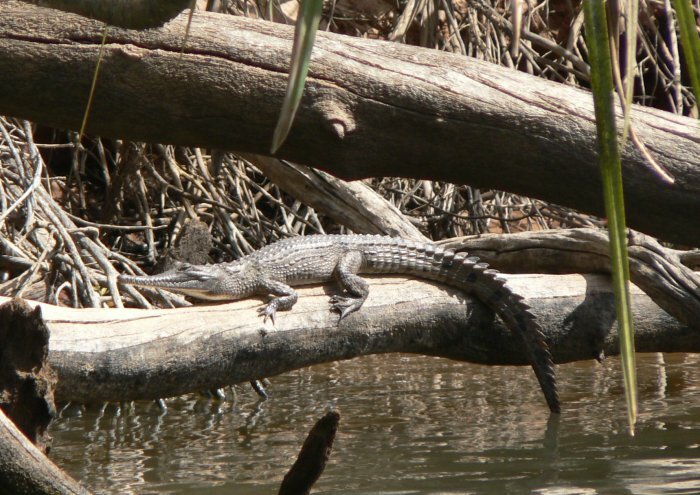 Later we took a boat trip on the Adelaide River, home to around fifteen thousand of this protected specie. Here they populate the banks with about one female every 90m and males controlling around 500m. This one was tempted to lazily leap for a lure of pork chop. The highpoint of our five day tour was without doubt the Yellow River, a complex of streams, billabongs and flooded plain that was home to an amazing quantity of wildlife. 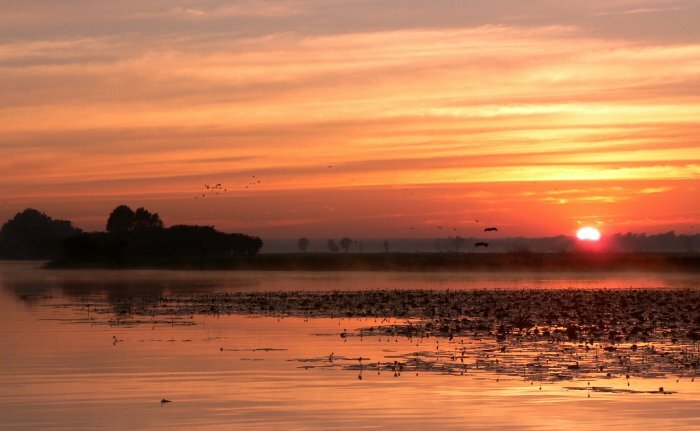 Our trip began at dawn so we were treated to the sight of a profusion of birds, fish and crocs beginning a new day. 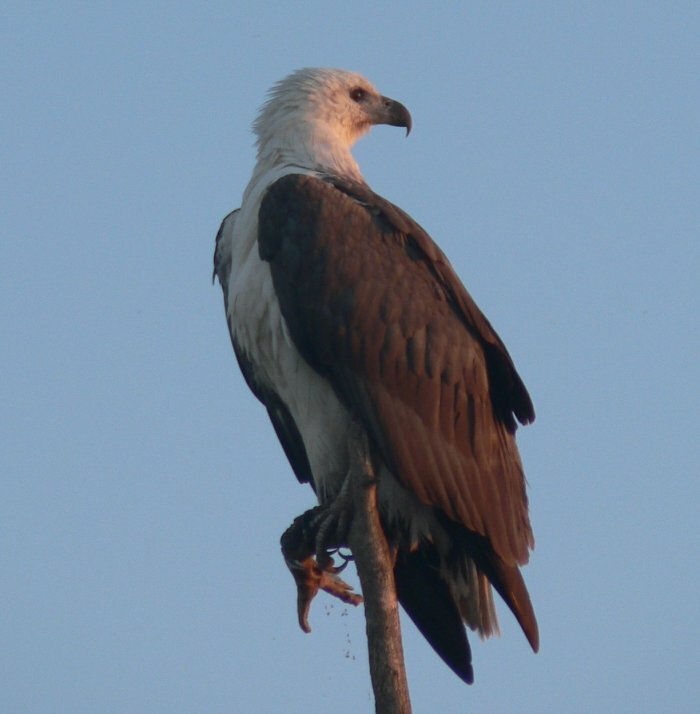 It is difficult to choose one of the tens of staggering images we came back with so this eagle will have to represent them all. Big lizards abound in this most feral of lands. 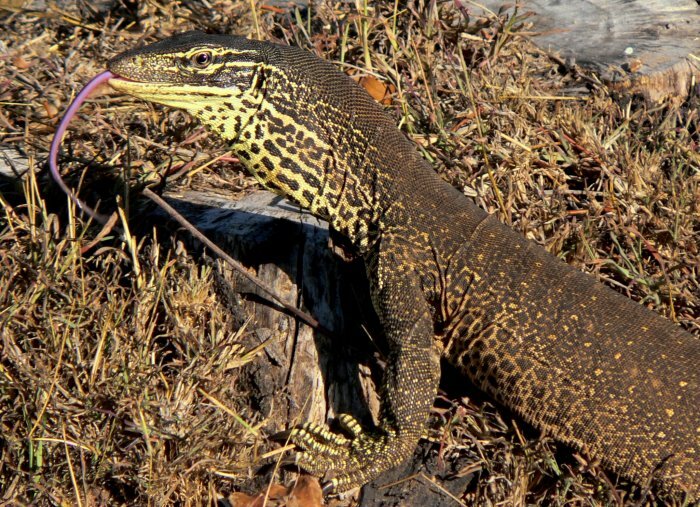 We had come across a 2+m long goanna on a hike not long after arriving in Oz two years ago. However, of the around a hundred we have observed, never had one been so rude as to put is tongue out in our presence. It seems almost unreal in its colouring and also in the way it seems to reach around without apparent visual control. To close our tale this time we have a variant of our usual sunset theme. Not that sunsets are a problem, we get dramatic ones virtually every evening from the Darwin Sailing Club. We leave for Kupang on West Timor, Indonesia on 21st July. By October we should be in Singapore and thinking about moving on to Malaysia and Thailand, probably fetching up in Phuket for this coming Christmas. With great regret we have left the Pacific behind now and are in the Timor Sea, part of the Indian Ocean. This move is largely prompted by a feeling that we would like to be nearer to our family as grandchildren and their great-grandma Kitty, grow older and the elastic joining us gets drawn ever tighter. Our current thoughts are to spend several years in SE Asia. It is a great cruising ground, the Andaman Sea being scattered with small islands and good diving. There are also excellent connections by air, especially to Asia, so it will make a good base from which to tour China, Vietnam, the Himalayas, etc.